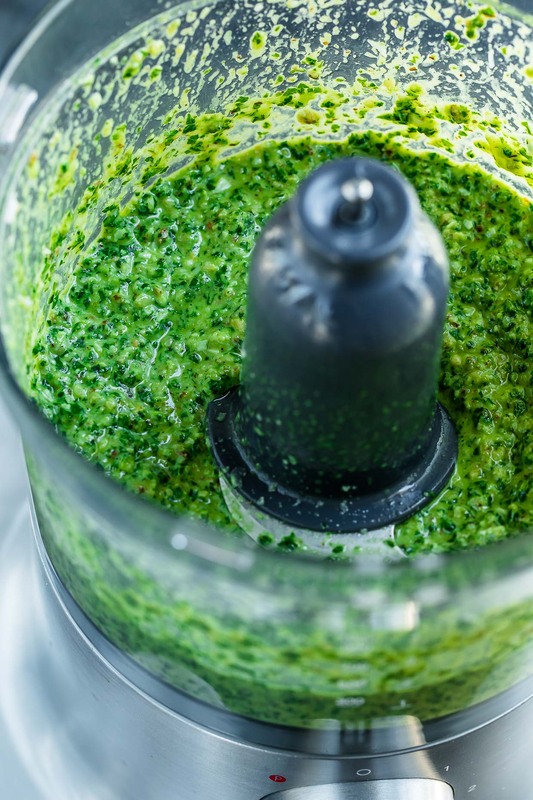 Let’s sneak in some extra veggies with this tasty kale pesto recipe! It’s easy to make and ready in minutes. Did y’all know kale is mostly a cool-weather crop? Oh yes! Though you may see it frequently highlighted in salads, kale is best in the cooler Fall and Winter months. The leaves are more crisp and fresh, the flavor is way better, and it’s actually BALLER in comfort food classics like pasta and casseroles! It’s also straight up amazing transformed into pretty green pesto. 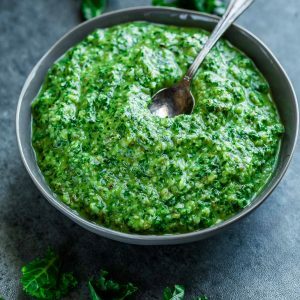 The kale leaves don’t brown like basil does, so you’re left with a vibrant-hued pesto that is ready to rock your plate! I love using my kale pesto in super simple pasta dishes and also as a base for pizzas and flatbreads! It’s straight up amazing as a base for my Cheesy Broccoli Kale Pesto Pizza and it can even be slathered onto grilled cheese and paninis too. Ready to get started? KALE YEAH! This awesome kale pesto is crazy flavorful and a little goes a long way! It’s gloriously freezer-friendly and keeps for about 4 days in the fridge as well. For this pesto feel free to use parmesan, romano or a parm-romano blend – just whatever you do, grate the cheese fresh for optimal flavor. Packaged parm tends to be seriously lacking! Because the cheese is naturally salty, I highly suggest adding your salt after the cheese and tasting as you go. (Dive in with some fresh baguette and make a snack of it!) You can start with about 1/4-1/2 tsp and add extra as desired. 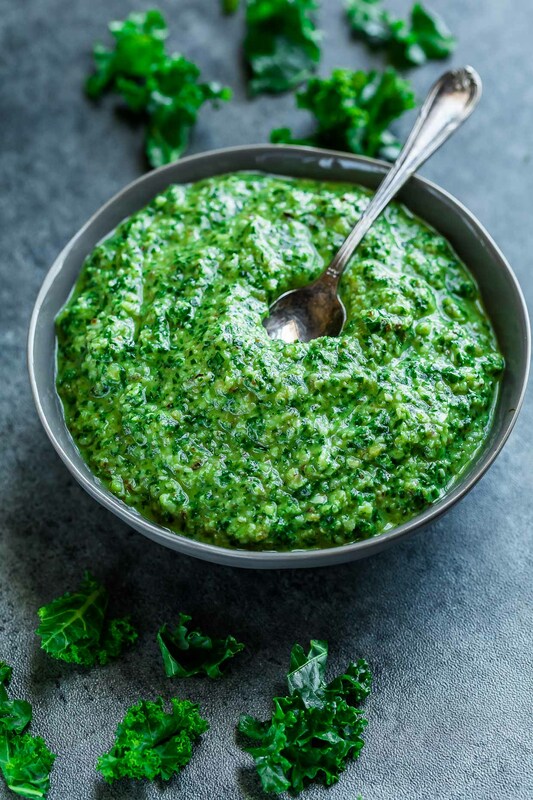 Let's sneak in some extra veggies with this tasty kale pesto recipe! It's easy to make and ready in minutes. First toast your walnuts! Heat your oven or toaster oven to 350°F and spread walnuts, spaced on a baking sheet. Roast for 5 to 10 minutes, shaking/tossing the pan occasionally to ensure even cooking. Add walnuts and garlic to your food processor. Pulse until both are minced. Next add kale, spinach (or basil), salt, juice of one lemon, and optional parmesan cheese. Blend well, adding the olive oil through the top of the processor towards the very end and gently blending to incorporate. Since everyone's perfect pesto varies, feel free to adjust seasoning to taste as well as the liquid to veggie ratio, an extra drizzle or two of olive oil can thin the sauce as desired. I usually snag a piece of crusty bread and dunk as I taste test, it's glorious! Try to choose an olive oil you love the taste of, a quality oil is key here! See post for some tasty serving suggestions for kale pesto. If you get a chance to try this tasty kale pesto recipe, let me know! Leave some love in the comment form below or tag your photos with @peasandcrayons on Instagram so I can happy dance over your creation!